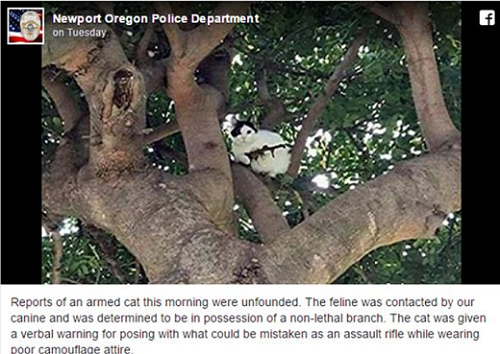 A worried member of the public alerted police to a cat sitting in a tree nestling a RIFLE in its paws. Officers in Newport, Oregon, reacted in style when they realised the picture they had been sent of the gangster kitty was simply an optical illusion. The cat's position, the colours, and the shape of the branch all conspired to make it look it was toting a weapon. Police told local news station KATU (obviously) that someone took the picture and then realized what it looked like. In a Facebook post, the Newport Police Department said they warned the moggie. The post read: "Reports of an armed cat this morning were unfounded. The feline was contacted by our canine and was determined to be in possession of a non-lethal branch. "The cat was given a verbal warning for posing with what could be mistaken as an assault rifle while wearing poor camouflage attire."